Discussions Magazine Music Blog: LESS THAN 4/By Blood By Heart: Available NOW! 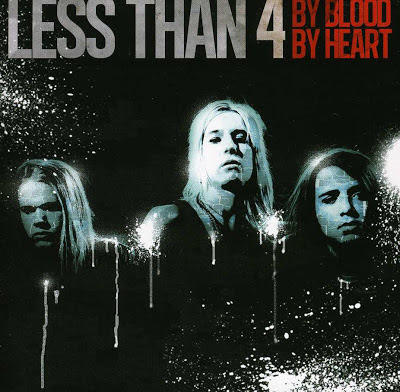 LESS THAN 4/By Blood By Heart: Available NOW! When most of their schoolmates are probably at a karaoke party singing the latest One Direction single, Swedish teenage trio Less Than 4 are creating music that rocks just as convincingly as that of their Hard Rock contemporaries, most of whom are nearly twice their age! Less Than 4 play a melodic blend of Glam, AOR and Melodic Metal that recalls the best of the '80s and early '90s hair bands. They possess a raw charm that is not overly-produced yet melodic and easily accessible (especially for those of us who crave a melody amongst the mayhem). They have the swagger, the riffs, the chants, the hooks and the passion... and it all comes together beautifully on this, their debut album. With a drummer that is barely 16, an 18 year old singer/guitarist and a bassist that, at 19, is the elder statesman in the band, Less Than 4 should not be this good... but they are! Hard Rock, Metal, and AOR have never gone away (the awesome Frontiers label is proof) but these guys were born in the age of Grunge and glossy, commercial (and completely insincere) Punk/Pop so its nice to see them reach back a little further than Blink 182 and Green Day. In fact, it's like the last 20-something years never happened and they are just picking up where 1989 left off! Can't wait to see where they go from here!